The Aspect Camera Assembly (ACA) is capable of providing simultaneous optical monitoring of a target during an observation. This thread describes the steps involved in processing the ACA monitor data. Generate a photometric light curve for a Chandra target which was observed using an ACA monitor window. This is accomplished by use of the monitor_photom script. Last Update: 22 Dec 2014 - Review for CIAO 4.7; modified equations to use mathjax. This thread assumes familiarity with the basic ACA operating principles as described in the Pointing Control and Aspect Determination System chapter of the Proposers' Observatory Guide (POG). This includes the concepts of image slots and readout windows. The key challenge in deriving a photometric light curve from ACA monitor window data is determining the background dark current. Due to ionizing radiation in the space environment, more than 1/3 of the pixels on the ACA CCD have detectable damage as manifested by an elevated dark current, as shown in Figure 1. The main Gaussian peak of the dark current distribution, representing undamaged pixels, dominates below about 30 e-/sec. Above that value the pixels have been damaged by cosmic radiation. In aspect pipeline processing a pixel with a dark current of more than 200 e-/sec is considered "warm" because at this level centroiding can be perturbed. A 15th magnitude source produces only about 500 e-/sec, so for faint sources the impact of these warm pixels is significant. To make matters worse, many warm pixels show time dependent flickering behavior in which the pixel dark current can abruptly change by a factor of two or more. 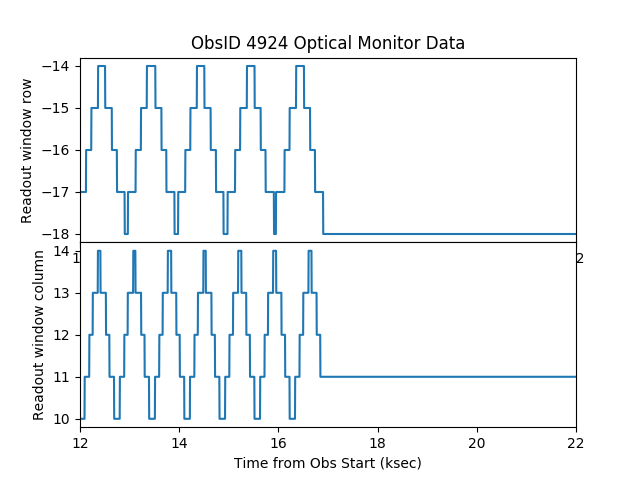 This flickering occurs on time scales of thousands of seconds, making it essentially impossible to produce a reliable dark current map using the ACA calibration mode. Instead we use on-the-fly warm pixel detection. The basic idea of the detection algorithm is to sample pixels from the outer edge of the 8x8 pixel readout window and look for values higher than a threshold. At the edge the contamination of the dark current measurement from the monitor star is minimized. Since the readout window moves with respect to the CCD due to dither, the edge pixels end up sampling much of the CCD region used for imaging. In this way one can build up a map of warm pixels. Background pixel sampling is not complete nor uniform. For brighter stars even the edge pixels have significant contribution from the star light so it is not possible to get a true dark current measurement. The dark_ratio tool parameter (see below) specifies that the warm pixel threshold be no less than dark_ratio * avg_source_counts. The current algorithm in the monitor_photom script does not account for flickering, though this could be done with some effort. Only monitor window data processed with an ASCDSVER of DS 7.6.0 or higher should be used in this thread. 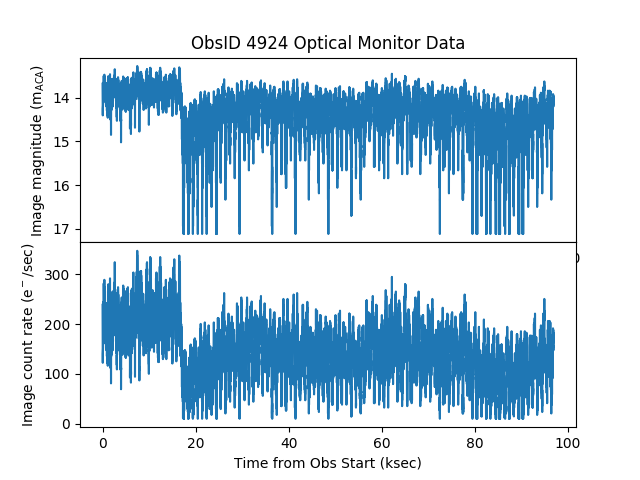 Note that monitor window data are only available if the observer has specified target photometry (Photometry=Y) in the observation setup. This can be determined by examining the Obscat parameters, available via Web Chaser for a specific ObsID. The PCAD Level 1 ACA image data files (pcad...adat71.fits) are secondary data products. They can be retrieved using download_chandra_obsid They will be located in the secondary/aspect directory. Or they can be retrieved via WebChaser by selecting the Secondary data products. These files contain the processed ACA telemetry and image data for the observation. The "7" in "adat71" refers to image slot 7, which is the slot where monitor window data always appear. While there may be many more files in the data package (i.e. adat01 - adat61), this thread will only be using the adat71.fits data. The ACA files are input to the tool as a stack; see ahelp stack for more information. Read the image data file. Median filter image data in time on a pixel-by-pixel basis to remove cosmic rays. Search for "warm" pixels that have a dark current well outside the normal distribution. These pixels can significantly affect photometry as they dither in and out of the 8x8 pixel image readout window. Subtract the background from each image readout. For warm pixels the detected value for that pixel is used, while for all others the median background dark current reported by the ACA is used. Produce light curves in counts, counts/sec, and mags. (clobber = no)              Remove output file if it already exists? The parameters dark_ratio, min_dark_limit, and min_dark_meas affect the way in which warm pixels are detected. The default values in the supplied parameter file are a good starting place, but it is often helpful to adjust the the dark_ratio and/or min_dark_limit to obtain better results. 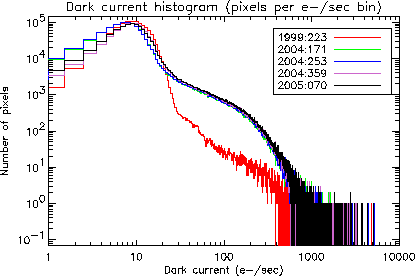 The script does cosmic ray removal, reports on the average image counts (in e- for the 1.696 second integration) and the minimum dark current for warm pixels, and then makes a dark current stack to detect warm pixels. This is based on the typical spectral energy distribution of bright main sequence stars. The data clearly shows a periodicity with an amplitude of approximately 1000 e-/sec. To check whether the periodicity is the result of the star dithering across an unidentified warm pixel, the data can be period folded at the telescope dither frequencies. The default dither frequencies for ACIS and HRC are listed below (taken from the the Chandra Proposer's Guide). These values are standard for most observations. Users can check for non-standard dither frequencies by checking the Details page of Web Chaser. Users can check which is the dominant frequency by computing the power spectrum of the light curve. 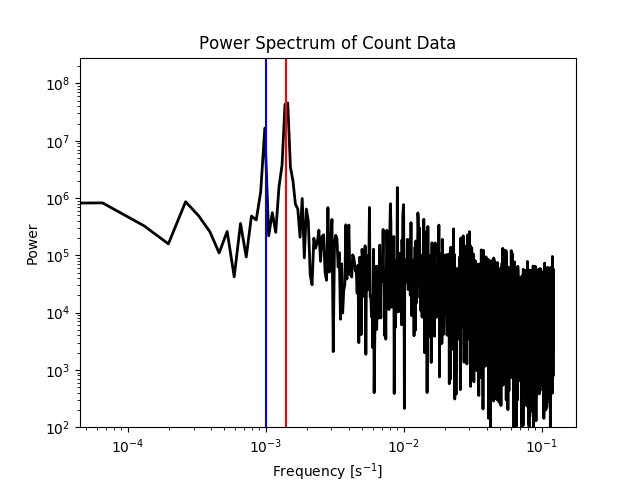 In the example below, the mean counts are subtracted off each light curve bin to remove the 0-frequency spike in the power spectrum. As shown in Figure 3, there are two peaks in the power spectrum that correspond exactly to the two dither frequencies, confirming that the periodicity is induced by dither. 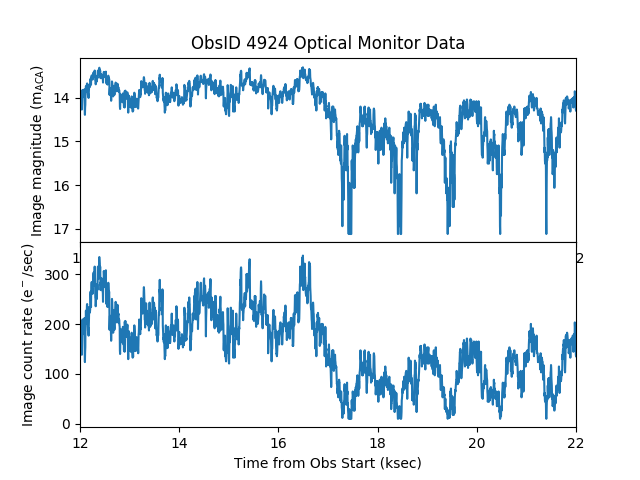 The power spectrum of the ACA optical monitor data shows two spikes. The red line is at a period of 707.1 sec and the blue line is at a period of 1000.0 sec; both are the standard dither frequencies. The light curve data can now be folded at the 707.1 sec dither frequency. This is done using the NumPy mod (modulo) operation. The data after being folded are shown in Figure 4. The sinusoidal pattern is the indication that the period chosen to fold the data was correct. 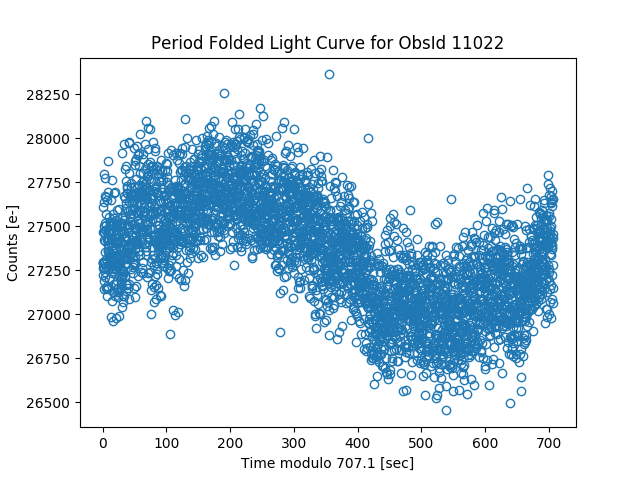 The light curve data after 707.1 sec period folding. The sinusoidal nature of the data becomes very clear. The 707.1 sec period was chosen since it was the frequency with most power as shown in Figure 3. There are situations when the ACA cannot track the optical monitor star. When that happens the utility of the optical monitor data becomes limited. One such example is OBS_ID 4924. The impact to the photometry due to not tracking the source can be seen in Figure 7. The dither pattern is no longer due to the source dithering across warm pixels, but instead is due to the stationary ACA monitor window dithering onto the source. The data after the loss of tracking is not generally useful. 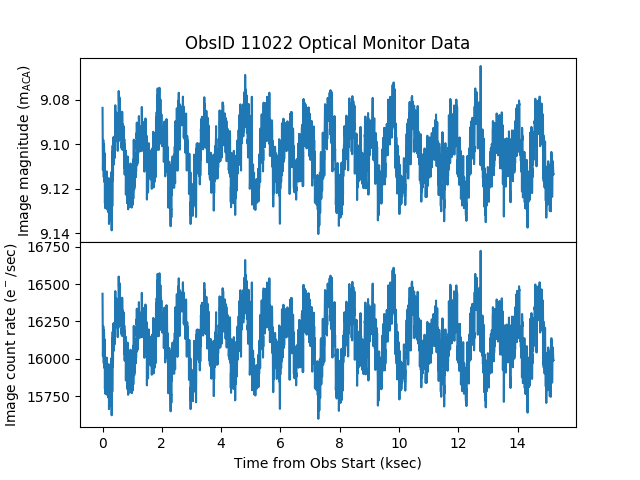 If the monitor photometry data indicate scientifically interesting results worthy of detailed study, users may wish to contact aspect_help@cfa.harvard.edu for further advice on possible techniques to reduce the systematic errors. 21 Apr 2014 Updated for CIAO 4.6; new version of script required. 01 May 2014 Replaced problematic obsid 4924 with 11022. 22 Dec 2014 Review for CIAO 4.7; modified equations to use mathjax.